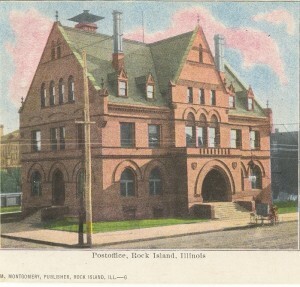 Rock Island had a post office before we even had a town. Starting in 1825, Colonel George Davenport’s small trading post on the island was where the small amount of mail was received and sent. Col. Davenport’s commission reportedly appointed him postmaster of Rock Island, Missouri. By 1834, the first official post office was established in the 2-room log home of Postmaster Joseph Conway in Farnhamsburg (near what is now Sacred Heart Church). 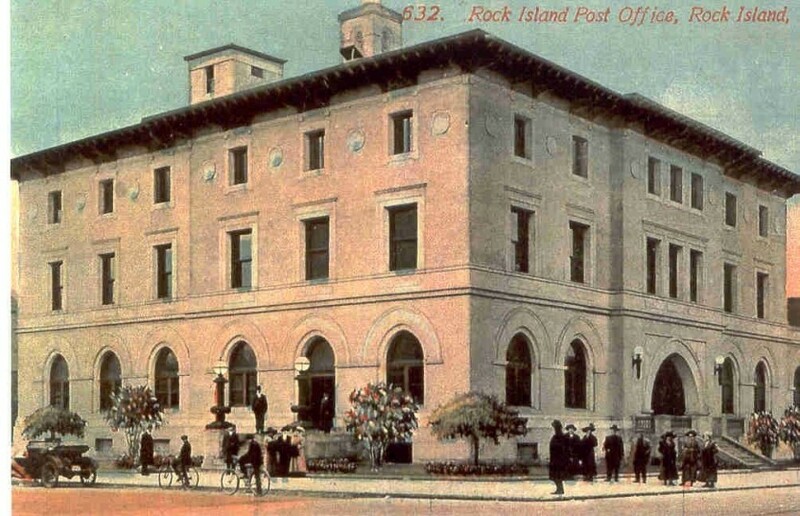 The post office operated out of different downtown buildings at various times, until 1896 when the first Federal Building was constructed at the southwest corner of 2nd Avenue and 16th Street. That building, which is shown in today’s postcard looked very different in 1896. A drawing that appeared in the Argus of the era shows a 2-½ story brick building with steep gables facing all four directions. A different early postcard of a street scene, shows the building with a small one-story “porch” on 2nd Avenue that has a massive arch framing the recessed main entrance. Windows on the first floor were also located under wide arches. The building was constructed by contractor John Volk and was reported to be a “model of beauty, convenience, and thorough and fine finish”. The interior had light colored tile floors and darker marble wainscoting. Glass and brass-screened windows atop carved oak counters separated the clerks from the public. Even the furnishings – from roll top desks to wardrobes – were of oak. Offices featured large mirrors in addition to the oak. Little more than a decade after construction, plans were made to expand the building, with the expansion not accomplished until 1914. Although initial estimates were $45,000, the final cost was reported to be $125,000. When we compare the post office on today’s postcard with the original post office, we see that a full third story has been added. It also appears that the red brick was covered with stucco (stucco reached its height of popularity in Rock Island between 1910 and 1920). First and second floors had minimal exterior changes, other than the stucco surface. The first story “porch” was eliminated and the one-story addition shown on the right is new. The three-story section at the far left may have been added as well. The windows on the top story appear to be the same as those that were originally in dormers on the steep gable roof, but the roof has been both lowered and flattened. 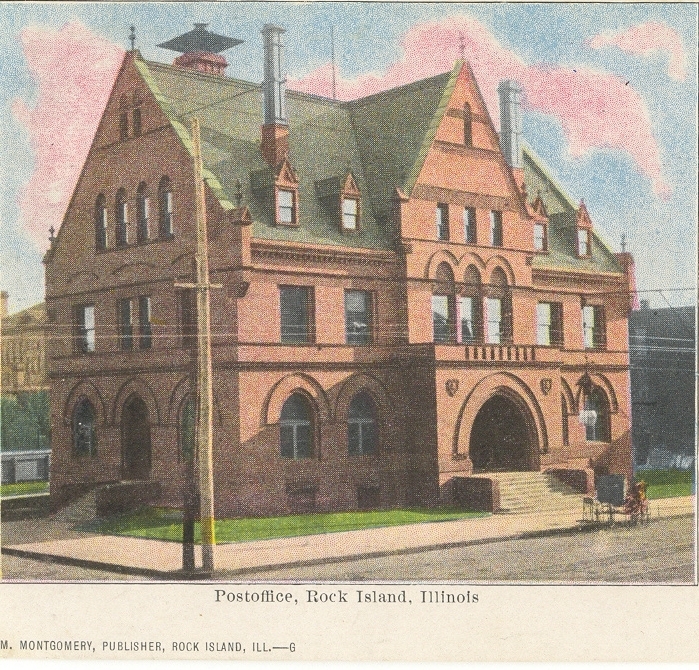 The photo used for the postcard was probably taken shortly after the remodeled post office was occupied. Notice how the people are posed – they are grouped in a casual manner, but all are looking toward the camera, even the bicyclists. Although the auto is unoccupied, the cyclists are astride their vehicles. Ads for bicycles of all types – both for men and women — appeared on a daily basis. An Argus article in February 1914 celebrated the opening of the remodeled post office by publishing a history with a list of previous postmasters, most of whom served very short terms. It is interesting that many were prominent community leaders in other fields. Among them were Col. John Buford, Virginia native who became Illinois State Senator; William Jackson, leading attorney who was known as the father of Rock Island parks; Major C. W. Hawes, Head Clerk of Modern Woodmen; John W. Potter, founder of the Argus; and August Huesing, bottler who established A.D. Huesing. This remained the home of the post office and federal building until a new post office was completed in 1957. It was built under a lease-purchase law that allowed it to be constructed by private contractors then leased to the government, with the lease payments being applied to the purchase price. City officials offered Spencer Square, a beautifully landscaped downtown park to the federal government in exchange for our old post office. Construction was delayed when 21 heirs of the three men who owned Spencer Square from 1836 to 1876 filed suit in federal court to contest the city’s ownership and hence its right to dispose of Spencer Square. Needless to say, the suit failed and the new $2 million dollar now sits on the square block between 19th and 20th Streets that was Spencer Square. Within a year, the pictured post office disappeared from city directories. Its site is now part of the Royal Neighbors of America parking lot. This article by Diane Oestreich is slightly modified from the original, which appeared in the Rock Island Argus and Moline Dispatch on August 26, 2001.